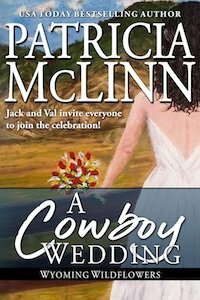 Jack and Valerie invite you to share the big day with them and other characters you’ve come to love in A Cowboy Wedding. Actually, it will be more like their big week, with lots of goings-on at the Slash-C Ranch and in and around Knighton, Wyoming. Plus, there are romances going on with other characters you’ve met if you’ve read The Rancher Meets His Match in the Bardville, Wyoming series and the seaside Massachusetts romance A New World, the prequel to Jack’s Heart where Jack and Valerie meet. It’s going to be a huge party, with romance and intrigue, a little unfinished business, and a reunion of some of my favorite characters. A Cowboy Wedding is now available at your favorite e-book retailer and in print at Amazon. No gifts. Absolutely no gifts. The greatest present is your good wishes. Donna Currick stared out to where the Big Horn Mountains lifted the western horizon toward a sky bedazzled in erratic streaks of orange, red, purple, yellow. These quilts had been shared by dear neighbors and friends from around the Slash-C and Knighton, Wyoming. She wanted to make absolutely certain they were safe. But something in Donna’s stillness stopped her. The matriarch of the Slash-C smiled as she said, “I’m fine.” Yet she kept staring at that horizon. “Thinking about what?” Even as she asked, Valerie wondered at herself for pursuing this. She and Jack were getting married next weekend, friends and family would begin arriving Tuesday, and despite their determined effort to keep this wedding simple, fun, low-key, and uncomplicated, with invaluable help from Donna and her daughter-in-law Matty, myriad details — hello? the quilts? — kept popping up like prairie dog holes as far as she could see. “I’m thinking about weddings. Do you ever think about weddings?” Donna asked dreamily. This dreamy, unfocused tone was so unlike Donna that Val was … not weirded out, because that wasn’t possible with this gracious, caring, practical woman. When Donna had married Ed Currick and come to the Slash-C decades ago to start a life and a family, everyone said it was the making of the man and the ranch. Now she and Ed were enjoying retirement while their son Dave, his wife Matty, and Jack Ralston, as foreman, ran the Slash-C.
From the small house built for them on the ranch as a home base, Donna and Ed traveled as they pleased, which these days largely revolved around their grandchildren in New York, where their daughter and son-in-law lived. A year ago, Donna had been instrumental in helping Jack and Val overcome a major hurdle to realize they truly loved each other. Well, mostly Donna helped Jack overcome it, because he was hard-headed and stubborn. Val, on the other hand, had known they should be together long before he’d recognized it. Something she reminded him of … now and then. With all that she owed Donna, Val mentally told the quilts they’d have to wait a minute, and asked the question she thought the older woman wanted to answer. Oh, yes, she had, and if she could do that right this minute with Jack, she would. She touched her stomach. Already had. Her family had certainly already taken Jack in during this past winter he’d spent with her in Gloucester, Massachusetts. And loved him. He had no biological relatives that he knew of. His family were the people of the Slash-C, who had already taken Val to their hearts when she arrived here unexpectedly last summer. Val smiled, thinking of all the wonderful friends she’d made in Wyoming, as well as the friends from earlier times who would be arriving next week. Finally — finally — she and Jack would get to meet her. Kiernan had clearly been head over heels for her last winter, but she and Jack and Addie had returned to Wyoming before he introduced her to anyone in Gloucester. Val had heard reports from her cousin, Eleanor, and El’s husband Cahill, who was Kiernan’s older brother. Now she’d finally get to meet Felicity, The Mystery Woman herself. And make up her own mind. Kiernan was all grown up, and a handsome devil, yet Val felt oddly protective of the now-man who towered over her. Donna turned toward Val, the vagueness gone, replaced by a smile. “It was all Jack’s doing. He got to know them through Dax and Hannah Randall. He and Dax connected over abused horses. It’s too bad Cambria and Boone can’t come for the whole time, but at least they’ll be here for the wedding,” she said of the Westons’ daughter and son-in-law. “A wedding?” Ethan Chalmers repeated his older sister’s words, but without her enthusiasm. Paige sat back, quietly prepared to wait out what would come. She’d known the Chalmers most of her life. For nearly as long she’d been in love with Ethan Chalmers. “It’ll be fun,” Hannah said firmly. She was a decade older than Ethan and his twin sister, Mandy, and had taken on raising them when their parents died before the twins started high school. “That’s exactly why she didn’t tell you,” Mandy said. Rather a strange term for this tall, broad-shouldered, handsome, grown-up man she intended to spend the rest of her life with. But maybe because she and Ethan Chalmers had started dating so young, it fit. “I think it will be fun,” Mandy said. She looked over at him. Two reactions — both familiar and long-standing — welled up in her simultaneously. How much she loved him. How smart he was about most things and astonishingly dim about a few others. For example, you’d think he’d know his twin — for that matter, both his sisters — better by now. “Just because you’re a dour grump who objects to romance because you think it doesn’t fit The Plan—” Mandy started. “Mandy,” Hannah inserted before she got too personal. “Ethan,” Hannah scolded. If the twins started critiquing each other’s comments, this would not only get off track fast, but it could go on forever. “If it comes to that, we’ll adopt,” he said calmly. “She’s already pregnant?” Ethan asked. “Because Hannah did such a lousy job of bringing us up after Mom and Dad died,” Mandy shot back. “Dax?” Hannah invited her husband into the fray. As usual, he’d stayed out of the twins’ tiffs. In general, Paige agreed with that strategy, because the only thing that got them wound up more than each other was anyone — anyone — saying something about the other twin. The exceptions for Dax’s noninvolvement were if Hannah asked him to step in or if he thought anyone got too rough with her, in which case he stepped in, asked or not. The Westons had started a B&B to smooth out dips in their ranching income. It hadn’t thrived until their daughter, Cambria, took it over. Cambria and her husband, who owned a successful log-building company, and their family now split time between North Carolina and Wyoming. But before that, when Boone Dorsey Smith was courting Cambria, he’d brought his employee, Hannah Chalmers, here to Bardville, Wyoming, for a working vacation. That’s when she and Dax met. “What would you say then?” Mandy challenged him. “Not more,” Hannah instantly said, ceding that anyone topped her husband at anything. Paige raised a hand to mask her smile. “They must be really well trained to let those greenhorns loose on them,” Mandy said. “Back to this wedding,” Ethan said. Paige bit the inside of her cheeks. Ethan knew he’d lost that round, so he’d shifted to being reasonable, organized, and above trading barbs with Mandy … after trading barbs with her. “Nope. He’s playing in a college baseball summer league on the East Coast,” Dax said of the Westons’ son. “Also, I think there’s a girl,” Hannah said. “Pete Weston’s caught at last?” Mandy asked with a grin. “A day trip?” Mandy asked. Paige looked at the two sisters. That sounded like a set-up question. “You won’t be intruding. I guarantee it. And if you don’t stay where she tells you to stay you’ll mess up Matty’s plan. Ah, so Mandy had heard about the wedding before this conversation. Ethan didn’t seem to notice, though. Ethan’s ruminations were interrupted by Hannah standing quickly. Paige and Hannah exchanged a look of perfect understanding. If Ethan made a firm decision now it would be no and it would be hard to budge him. “Hey, I didn’t—” Ethan started. As they left in opposite directions, Paige looked over her shoulder. Hannah was doing the same. Their eyes met again. To her surprise, Paige heard a chuckle, and realized Dax was watching both of them.